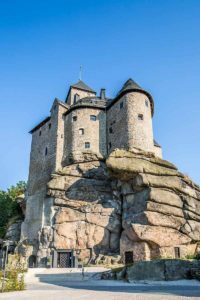 GRAFENWOEHR, Germany — Tons of castles are scattered across Germany, but the Falkenberg Castle is unique. With stones constructions over 1,000 years old, the castle is designed to withstand attacks. This massive example of architecture is just a half hour ride from Grafenwoehr. Over the decades it has been used as a fortress, a place of retreat, a symbol of power, an administrative center and a public-owned undertaking. First documents mention the structure in 1154. Many craftsmen settled in the area surrounding the castle, slowly building a micro economy. They offered services and dues to the lord at the time. In return, they were promised protection and justice. The castle is equipped with several protective mechanisms. An outer ditch surrounds the estate, a moat encircles the outer rim, a high floor with hatches protects the wall, and a draw bridge limits passage. The guard room also has several clear views and embrasures. The donjon, or castle keeper, was the last protection barrier. Even the geographical area was ideal, with the castle situated atop a high hill surrounded by granite rocks. It remained intact and was well protected from the Hussites during the 15th century. Two centuries later, however, more powerful fire weapons were invented and the time of castles came to a close. Graf Ernst von Mansfelt took over in 1621. Interestingly, Ernst von Mansfelt was also a supporter of Friedrich V, commonly known as the WinterKoenig, or Winter King, because of his winter-season reign. In 1643 — only a few years later — Sweden conquered the castle and left it in ruins. Bavarian King Ludwig I prohibited the break-up and repurpose of these castle ruins in 1840 and seized the ruins for government ownership. Friedrich-Werner Graf von der Schulenburg, a German diplomat and ambassador in Moscow, bought the castle as his retirement real estate. Following images from old paintings, he rebuilt the castle from 1936 – 1939. Schulenburg was part of the Operation Valkyrie, the failed assassination of Adolf Hitler. He was executed shortly after in 1944. The Gestapo confiscated the castle in World War II and arrested prisoners from the Flossenbuerg concentration camp. After the war, the Schulenburg family assumed ownership of the property. Markt Falkenberg bought the building and renovated it in 2008. The costly work was funded by different public money grants in Bavaria, Germany and other areas of Europe. Since its grand opening in 2015, visitors are invited to explore the castle’s museum and spend a night in the castle hotel. The castle also features a unique restaurant and a large knight’s hall with a capacity for 60 people. A new meeting center located next to the castle can also hold up to 120 guests. The castle is an outstanding place for weddings, balls and business meetings — or just a romantic dinner. GPS Directions: Burg 1, 95685 Falkenberg. The castle tour is available in English. 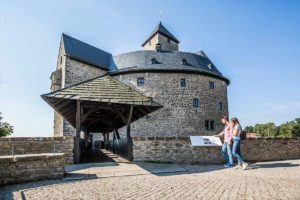 To book individual or group tours or for more information on conference bookings and the museum, call 09637-9299450 or visit www.burg-falkenberg.bayern.